A loan of $500 helped to buy rolling materials, paint colors, paint brushes, elei designs, containers, and printing machines. Emile is a 26-year-old mother with one child. She owns and operates a small business of selling elei printing materials at the market to earn a living. Emile needs a loan to buy rolling materials, paint colors, paint brushes, elei designs, containers, and printing machines, to help her run the business. She has been doing this for more than a year. 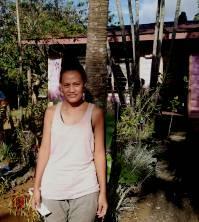 She hopes to build a small elei shop in her village. She became a member of SPBD in 2016. It provides women with credit in a country where alternative financing is extremely scarce.